If you have any enquiries or would like to submit an article to the magazine, please email the Communications Team, or call 01392 294904. The magazine does not take adverts but if you have a mission community event that may appeal to others you can advertise it on this website. Please send short details by email. It is accompanied by a monthly Prayer Diary and both are produced in different formats to suit different printers! Will you be part of the global prayer wave? 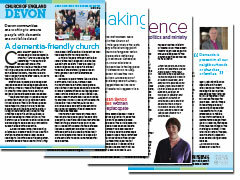 Pre-arranged: Large print magazine layout, pre-arranged for A4, for use on normal printers. Print double-sided on a single sheet of A3 and fold. Single pages: Large print magazine layout, single A4 pages for printing on A3 using office printers with ebooklet creation (print double-sided on a single sheet of A3 and fold), or for printing on individual sheets of A4 and binding. 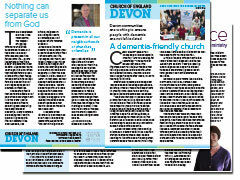 Text and images from the latest edition, for use in parish magazines and websites.